Three teams remain unbeaten after an opening day of world-class women's sevens at the Gold Coast 2018 Commonwealth Games with New Zealand and Canada already assured of a place in the semi-finals. Women's sevens announced its arrival on the Commonwealth Games stage with pulsating matches that had a packed Robina Stadium crowd on the edge of their seats as hosts Australia, world champions New Zealand and Canada ended the opening day unbeaten with two victories from two. New Zealand and Canada are already assured of a place in the semi-finals as the top two sides in Pool A, while Australia, Fiji and England are separated by only two points in the race to finish in the top two of Pool B. The final round of pool matches take place on Saturday on what will be another fascinating day with the men's competition getting underway before the medals are decided on Sunday. Canada were fast out of the blocks scoring in the first minute against a South African side looking to bounce back from the disappointment of losing in the World Rugby Women's Sevens Series qualifier for the second year in a row. Caroline Crossley had the honour of becoming the first women's try scorer in Commonwealth Games history. Brittany Benn, Sara Kaljuvee and Charity Williams followed her over the line for a 24-0 half-time lead for the Olympic bronze medallists, but South Africa managed to restrict them to just one try after the break through Hannah Darling. 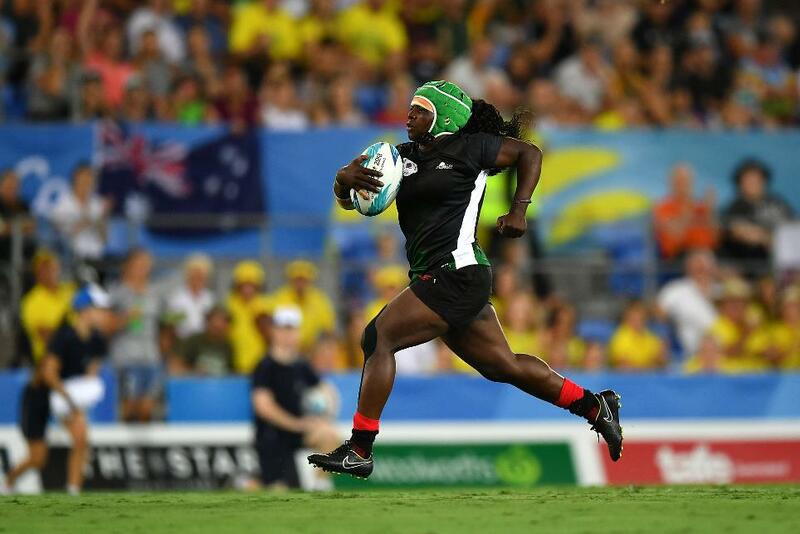 New Zealand then made their intentions clear for all to see with a clinical opening display against Kenya, speedster Portia Woodman scoring three of their sevens tries in a 45-0 win. Kelly Brazier stepped her way through the defence and raced 50 metres to score the Black Ferns' second try and it looked like the score would remain at 12-0 after some strong Kenyan defence, but then Gayle Broughton found a way through. Two tries in quick succession for Woodman completed her hat-trick before another brace for Niall Williams wrapped up the comfortable win. Canada became the first team to book their place in the semi-finals on Sunday with victory over Kenya, but the African side made them work hard for the 24-12 victory and had the crowd on their feet twice with two long-range tries through captain Philadelphia Olando (pictured left) and Janet Okelo, the latter showing a real turn of pace to leave the defence in her wake. Two tries from Bianca Farella, making her return from injury, sandwiched between the Kenya scores ensured that Canada ended the day with two wins from two. Olympic silver medallists New Zealand joined the Canadians in the semi-finals with another emphatic display of precision attacking, scoring sevens tries – including another brace for Woodman to take her tally for day one to five tries – to beat South Africa 41-0 to top the Pool A standings from Canada. Captain Sarah Goss opened the scoring inside a minute with Woodman, World Rugby Women's Sevens Player of the Year 2017 Michaela Blyde and Broughton tries making it 22-0 at the break before Woodman, Williams and Brazier wrapped up a dominant day for the Black Ferns. The opening match of Pool B proved a far tighter affair with England needing two tries in the dying minutes to squeeze past Fiji 17-5, the pick of them being an end-to-end try finished by Emily Scarratt after Fiji were unable to turn a period of prolonged pressure into points and the Red Roses launched a devastating counterattack. Lydia Thompson's try made certain of victory in a match which had been locked at 5-5 at half-time after Deborah Fleming's opener was cancelled out by Timaima Ravisa's try following more Fijian pressure. Australia then gave their vocal home support plenty to cheer about as the sun began to go down with a six-try, 34-5 defeat of Wales who did manage to do something that no other team has done in competition in 2018 by scoring a try against the Olympic champions through winger Jasmine Joyce. Emma Tonegato set the Australian win in motion before Evania Pelite, Ellia Green and co-captain Sharni Williams followed her over the line for a 24-0 half-time advantage. Green was put over in the corner for her second try before Joyce momentarily stopped the rot only for Dom du Toit to have the final say at the end. Fiji bounced back from the loss to England and rediscovered some of the style that took them to fourth place on the world series in 2016-17, Lavenia Tinai showing her power to score a try either side of one by Viniana Riwai to give them a 19-0 half-time lead against Wales. Tinai completed her hat-trick within a minute of the restart before Ana Naimasi dotted down to keep Fiji's hopes of a semi-final place alive with Wales only able to add a late consolation score through Team GB Olympian Joyce to go down 29-7. The curtain came down on the day with an enthralling battle between Australia and England with both knowing that victory would boost their hopes of a place in the last four. Megan Jones looked set to give England the lead when she burst through into space only to lose control of the ball in the clear. Tonegato instead sold the defence a dummy to dart through and open the scoring, but England responded with tries from captain Abbie Brown and Fleming only to see the footwork and pace of Green bring the crowd to their feet with a 60-metre try to tie the scores at 12-12 at half-time. The noise continued to ratchet up with further tries from Emma Sykes and Pelite before Cassie Staples finished arguably the try of the day to seal a 29-12 victory.